My other son Jesse is entering his second season of cross country in two weeks and realized this week he'd better get out and get some conditioning in before the season. 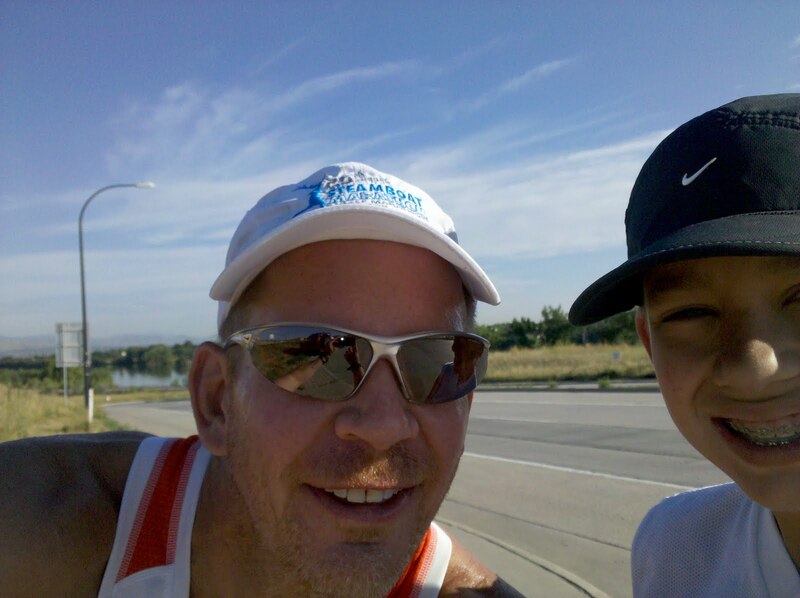 While dad is in the middle of a 600 mile training program for the Georgetown to Idaho Springs Half Marathon and Portland Marathon, I had to turn the (speed and distance) dial down for yesterday's 1.5 mile run with Jesse. For a marathon runner, that's like a 100 yard dash especially considering my planned 20 mile training run on Saturday morning in Boulder. You can bet that it was the best run of the week though. I picked a section of the Highline Canal that I thought was flat, but didn't seem like it to Jesse. Trying to "beat the heat" and get the morning run in before work, we got out of the house without water. Not a biggie for me, but Jesse was dying for a bottle of the cold stuff by the end. Today, he asked if my legs hurt since he was feeling the pain of waking up muscles that have been dormant since last Spring's track meet. No...they feel okay, but ask me again on Saturday after my 20 mile run. Check out the video interview of Jesse below.